During the 2016 campaign, Donald J. Trump’s second campaign chairman, Paul Manafort, had regular communications with his longtime associate — a former Russian military translator in Kiev who has been investigated in Ukraine on suspicion of being a Russian intelligence agent. At the Republican National Convention in July, J. D. Gordon, a former Pentagon official on Mr. Trump’s national security team, met with the Russian ambassador, Sergey Kislyak, at a time when Mr. Gordon was helping keep hawkish language on Russia’s conflict with Ukraine out of the party’s platform. And Jason Greenblatt, a former Trump Organization lawyer and now a special representative for international negotiations at the White House, met last summer with Rabbi Berel Lazar, the chief rabbi of Russia and an ally of Russia’s president, Vladimir V. Putin. Democrats see suspicious connections and inaccurate denials as part of a pattern that belies Mr. Trump’s adamant insistence that he and his associates “have nothing to do with Russia.” The president’s supporters say innocuous encounters, routine for any incoming presidential team, are being treated for political reasons as somehow subversive. On Friday, Mr. Trump posted a picture on Twitter of a meeting between Mr. Putin and Senator Chuck Schumer of New York, the Democratic leader, and wrote that “we should start an immediate investigation into @SenSchumer and his ties to Russia and Putin. Paul Manafort, Donald J. Trump’s second campaign chairman, had regular contact with an associate linked to Russia during the 2016 campaign. The issue has already had momentous consequences for the new administration. Michael T. Flynn lasted less than a month as national security adviser before being forced out for mischaracterizing his conversations with Mr. Kislyak. This week, Attorney General Jeff Sessions admitted to having meetings with Mr. Kislyak that he had not disclosed during his confirmation hearing. Mr. Sessions fended off demands that he resign but agreed to recuse himself from what may be the most important investigation his Justice Department is conducting: of Russian meddling in the election and whether any of Mr. Trump’s associates colluded in those efforts. And that did not end the issue; all nine Democrats on the Senate Judiciary Committee called on Friday for Mr. Sessions to testify about his inaccurate denials that he had met with Russian officials during the campaign. In fact, vigorous reporting by multiple news media organizations is turning up multiple contacts between Trump associates and Russians who serve in or are close to Mr. Putin’s government. There have been courtesy calls, policy discussions and business contacts, though nothing has emerged publicly indicating anything more sinister. A dossier of allegations on Trump-Russia contacts, compiled by a former British intelligence agent for Mr. Trump’s political opponents, includes unproven claims that his aides collaborated in Russia’s hacking of Democratic targets. Current and former American officials have said that phone records and intercepted calls show that members of Mr. Trump’s 2016 presidential campaign and other Trump associates had repeated contacts with senior Russian intelligence officials in the year before the election. Former diplomats and Russia specialists say it would have been absurd and contrary to American interests for the Trump team to avoid meetings with Russians, either during or since the campaign. John R. Beyrle, the United States ambassador to Moscow from 2008 to 2012, said he feared that “we’re beginning to out-Russian the Russians” by treating all contacts as suspicious. When he returns to Russia now, he said, “this real anti-Western, anti-American frenzy” prompts some old acquaintances to refuse to meet him because they worry about being tagged as too friendly to the United States. “That’s the last behavior we should model — that simply meeting with a Russian official is wrong, without any knowledge of what was said,” Mr. Beyrle said. In a possible sign that Mr. Trump hopes to put behind him the impression that he is an uncritical admirer of Mr. Putin, he is expected to name Fiona Hill, a respected Brookings scholar, to the top Russia post at the National Security Council, according to administration officials. Ms. Hill, who served as national intelligence officer for Russia and Eurasia from 2006 to 2009, is viewed as a Putin skeptic, if not as outspoken in her criticism of the Russian leader as are some other academics. Angela Stent, a Russia expert at Georgetown, said Ms. Hill was “realistic about Putin” and praised the 2013 book she wrote with Clifford G. Gaddy, “Mr. Putin: Operative in the Kremlin,” as the best biography of the Russian leader. It might take a Russia scholar to unpack the significance of particular meetings that are now coming to light in the glare of investigations and bare-knuckle politics. Rabbi Lazar, who has condemned critics of Mr. Putin’s actions in Ukraine, is the leader of the Hasidic Chabad-Lubavitch group in Russia, where it is a powerful organization running dozens of schools and offering social services across the country, while maintaining links to a lucrative financial donor network. Michael T. Flynn, back right, who stepped down as Mr. Trump’s national security adviser. Joshua Nass, a public relations executive in New York, confirmed arranging the meeting between Mr. Lazar and Mr. Greenblatt. Mr. Gordon, the former Pentagon official, portrayed his meeting with Mr. Kislyak at the Republican convention — first reported by USA Today — as similarly unremarkable. 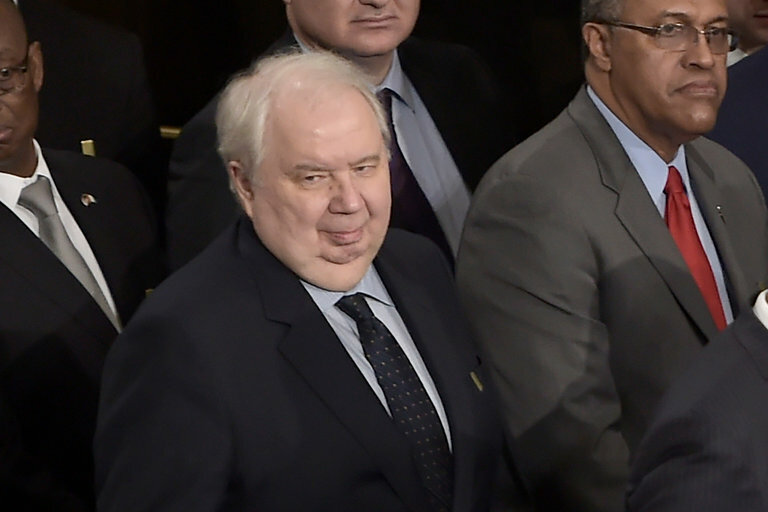 After a panel discussion, he said, he spoke briefly with “dozens of ambassadors and senior diplomats” including Mr. Kislyak. During a brief chat with the ambassador, Mr. Gordon said, he “repeated some of the points made by the campaign on the importance of improving relations with Russia” but did not get into substantive policy matters. There was no connection, he insisted, between his chat with Mr. Kislyak and the platform language. “Unfortunately some in the media have repeatedly tried to connect the dots where there was nothing to connect,” he said. The case of Konstantin V. Kilimnik, who was previously the Kiev manager of Mr. Manafort’s consulting company, Davis Manafort International, is more complicated. A dual citizen of Russia and Ukraine, Mr. Kilimnik worked years ago as a translator in the Russian military. He was hired by Mr. Manafort in 2005 after he was dismissed from the Moscow office of the International Republican Institute, an American democracy-building group, amid concerns that he was informing on its activities, according to a former employee, who said he could not speak publicly about personnel matters. From August until December of last year, Mr. Kilimnik was at least formally under investigation in Ukraine on suspicion of ties to Russian spy agencies, according to documents from Ukraine’s Parliament and the prosecutor general. A defense lawyer and a former Ukrainian prosecutor characterized the investigation as unserious and politically motivated, and the inquiry closed without charges against Mr. Kilimnik. Mr. Kilimnik, in an interview in Kiev, said he had never been questioned by Ukrainian law enforcement over connections to Russian spy agencies. “If there were any truth to me talking to any security service in the world, they would arrest me,” he said. In a recent interview, Mr. Manafort said he thought there was no chance Mr. Kilimnik was a Russian agent. In their phone calls last summer, he said, the two men discussed a range of matters — including news media reports that Russia was behind the hacking of Democratic targets. But at the time, he said, he and other Trump campaign officials had no idea who was responsible for the cyberattacks.